As a Queens property owner, you have an obligation to take steps to maintain and protect your home. One of the most important features of your home is its roof. Your roof provides your property with its first line of defense against adverse weather conditions and the elements. If it is damaged, your entire home is threatened. Whenever you notice that you are in need of roof repairs, the first thing that you should do is to contact a professionally licensed roof contractor. In Queens, the most highly skilled and qualified roofing contractors are at Eden Queens Roofing Contractors. Their team has the knowledge and experience necessary to repair any roofing type on both commercial and residential properties. With their assistance, you will be able to make the best choice as to how to secure your property. One of the major decisions will be whether to conduct repairs or to completely replace your roofing system. Here are a few signs that indicate that it will be more advantageous and cost-effective to replace the roof of your Queens property. The first consideration that you should make when you are conducting repairs is how old is the roof. Different roofing materials have different expected service lives. For example, a traditional asphalt shingle will generally last between 20 and 25 years. If the roof of your Queens property is nearing, within, or beyond this range, it is likely time to replace your it. Over time, wind, temperature changes, and water slowly yet constantly erode the surface of your roof. As such, it is inevitable that every roof will need to be replaced at some point. One sign that this erosion has occurred is the prevalence of asphalt shingles in your gutters. If there is a large build up of shingle granules in your shutters, you should hire a professionally licensed roofing contractor to assess the situation. One of the prime functions of your roofing system is to funnel water, ice, and snow from the surface. Critical to this objective are the roof valleys where different roofing planes meet. If there is damage to the valley area or shingles are missing, your property is subject to extensive water damage. 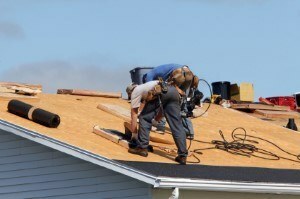 A Queens roofing contractor should be hired to determine if your roof should be replaced. In order to properly protect your property, your roof must have a water tight barrier. One easy inspection that you can conduct on your own is to go into your attic to see if any daylight permeates the surface. This is a tell tale sign that you need to replace the roof of your Queens home. If you need to hire a professionally licensed roofing contractor in Queens, call Eden Queens Roofing Contractors at 718-819-7700, or fill out our online request form.